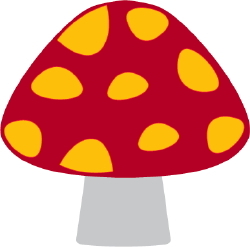 Clip art of a red mushroom with yellow spots. This image is free to use in your web site or project subject to our terms of service. Click the image to download a larger free version in JPG format. Or, you can download the hi-res version for $4 which provides the image in hi-resolution, in JPG, GIF, Photoshop, and Adobe Illustrator formats.